REVOs Complete 16-channel 660 TVL Night VisionSecurity Surveillance features 10 High Resolution cameras built to operate in both indoor and outdoor applications. REVOs Newest 16-channel DVR Security Surveillance features 10 High Resolution cameras. The 660 TV lines of resolution provide sharp, clear pictures. 10 Indoor/Outdoor Weather-resistant day/night cameras come equipped with a mounting bracket, sunshield and 30 infrared LEDs providing powerful illumination of up to 80' in total darkness. All cameras are easy to install and come complete with an all-in-one video/power/data/audio cable with REVOs exclusive quick connect cables. You'll never have to worry about how to get power to your cameras with the REVO DVR plug-and-play security system. Just connect them to the back of the DVR and you are ready! This professional, cost effective and expandable system has an easy set-up wizard and is also fully networkable. In Fact REVOs advanced PENTAPLEX technology maximizes the DVR by allowing you to View Live Video/Record/Search and Playback/Back up/Access DVR Remotely, ALL AT THE SAME TIME! The 1 TB Hard Disk Drive allows maximum video storage capacity. Our premium night vision surveillance system can see 80' in complete darkness! This ensures high quality viewing and recording in all low light conditions. The auto light compensation of this security system prevents washout from shadows, and keeps things like faces clear. Your video stays clear when you need it most, and in most conditions still provides a color recording! Our outdoor security cameras will withstand the elements for years to come, and provide you with clear, crisp recordings even in the midst of a storm. We do suggest that they be mounted under an overhang out of direct water exposure, but expect your outdoor surveillance video quality to be unparalleled. Super High Resolution Color Camera:Get crisp, clear images with 660 TV Lines durable, metal case housing, requires 0.0 lux (IR ON). Free lifetime technical support. REVO’s 5th generation of professional DVR’s continue to deliver commercial grade type features at affordable prices. 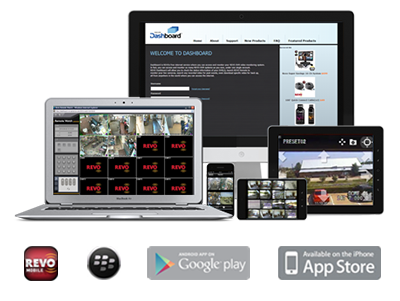 EZLink, Picture emails of camera’s current view, Push notifications to most smartphones, as well as full DVR access using your smartphone to control PTZ cameras, search recorded video and monitor audio while you’re on the go via REVO Mobile, a free app, are just a few of the features of this powerful, professional DVR. 1TB Hard Drive:Depending on settings, can yield months of record time.